CUNY Start, a pre-matriculation program developed by the City University of New York, seeks to help the lowest placed developmental education students become college ready in just one semester. The program targets incoming students who are assessed as needing remediation in math, reading, and writing by providing intensive instruction for one semester while students delay enrollment in college. It uses a conceptual student-centered curriculum and instructional delivery method and provides a robust approach to staffing and training that allows instructors to learn to implement these strategies while under the tutelage of experienced teachers. It also provides advising, tutoring, and a weekly seminar that teaches students skills they need to succeed in college. Students pay only $75 for the program and do not use financial aid. 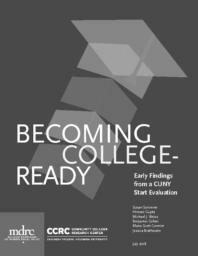 This report describes the early findings of a random assignment evaluation and implementation study of CUNY Start by CCRC, MDRC, and CUNY. After following CUNY Start and control group students for three semesters, the researchers found: CUNY Start was implemented as it was designed, and the contrast between the program and the colleges’ standard developmental courses and services was substantial. During the first semester in the study, program group students made substantially more progress through developmental education than control group students. Control group students earned more college credits than program group students, as predicted by CUNY Start’s designers. During the second semester, program group students enrolled at CUNY colleges either in CUNY Start or in non-CUNY Start courses at a higher rate than control group students.